Clogg, Richard. Parties and Elections in Greece: The Search for Legitimacy. Duke University Press. 1987. ISBN 9780822307945. Diamandouros, P. Nikiforos. "Transition to, and consolidation of, democratic politics in Greece, 1974–1983: A tentative assessment." West European Politics 7#2 (1984): 50-71. Michalopoulos, Dimitri,"Konstantinos Karamanlis and the Cyprus Issue, 1955-1959", in Osman KÖSE (ed. ), Tarihte Kıbrıs, vol. II, pp. 1021-1028 (ISBN 978-605-67945-0-6). Wilsford, David, ed. Political leaders of contemporary Western Europe: a biographical dictionary (Greenwood, 1995) pp. 217–23. Woodhouse, Christopher Montague. 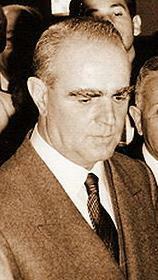 Karamanlis: the restorer of Greek democracy (Oxford University Press, 1982).